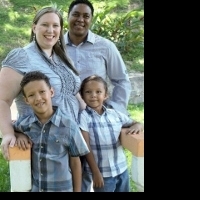 Berly and Jamie both grew up as pastor's kids in the Assemblies of God; Jamie in Washington State and Berly in the Dominican Republic. Berly's father formerly served as General Superintendent of the Assemblies of God in the Dominican Republic and is now the National Missions' Department Director and pastoring a church in Santo Domingo. Jamie's father, Wendell Kruger, serves as Consultant and Loan Originator with Assemblies of God Financial Services Group. Jamie sensed God's call to youth ministry during summer camp at age 17. She studied for two years at Western Washington University and then went on to graduate from Northwest College in Kirkland, WA with a Bachelor's degree in Youth Ministries. Upon graduation, she served as youth pastor in two churches of the Northwest Ministry Network for 5 years. As youth pastor, she began taking high school students on short term missions trips and soon sensed God directing her to full-time missions ministry with youth in Latin America. God's specific leading was to the Caribbean island nation of the Dominican Republic. In 1999 she was commissioned by the Assemblies of God as a single missionary and left for the field in 2001. As a young boy, Berly sensed God's call to music ministry with a specific desire to minister to youth through music. He began to study piano with tutors, and studied for a couple years at the Conservatory of Music in Santo Domingo, D.R as a teenager. Ever since, he has studied intensely on his own, and has become an accomplished pianist and composer of music. In 1998 he formed his own band, 2000 DC. They recorded their first album, Caminante, and ministered in churches and concerts through the Dominican Republic. For several years he served as worship pianist and music director in a few churches in the Dominican Republic. He also ministers with other Christian artists and groups as a studio recording artist, composer, and producer. More than halfway through Jamie's first missionary term in the Dominican Republic, she and Berly met as his local church's young adult camp. They began to work together in National Teen Ministries, and then married in January 2004. Upon their return to the States for itinerating, Berly completed his stateside missionary training and they were "re"-commissioned as a missionary couple with the Assemblies of God in the summer of 2004. They are now in itinerating in the USA from July 2016-Dec 2017 in order to return to the DR for their 4th missionary term. They direct Uconexion University Ministries (it's like Chi Alpha) and National Teen Ministries (aka MDA Ministerio de Adolescentes) and Berly produces music for recording artists in his Caminante Music Studio. Berly and Jamie have two sons: Ethan Manuel (born 3/19/09) and Logan Eugene (born 11/18/10).